What started as illegal street racing in American alleyways in the 1940s, is today one of the most widely spread motorsports in the world. 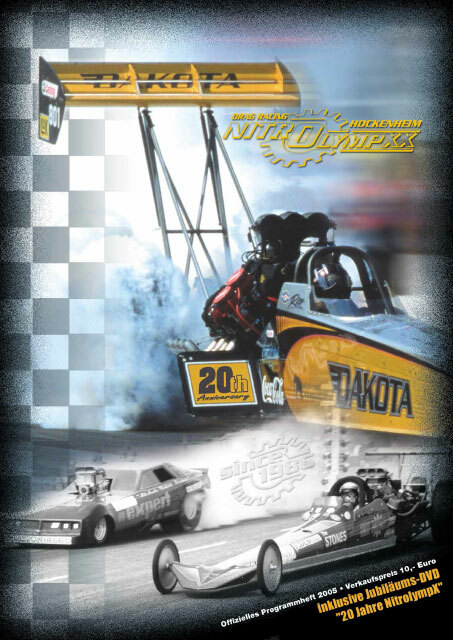 Over 3,500 dragster races take place every year in the USA and Canada alone. 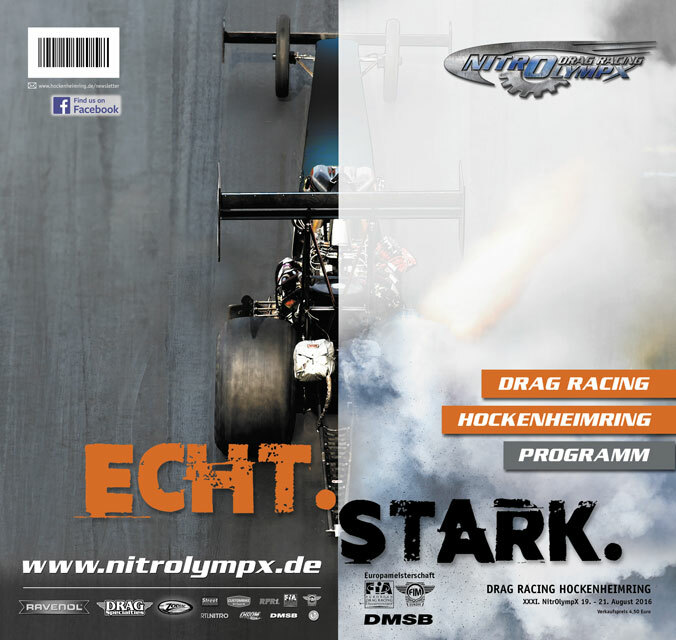 One of the largest events of this kind in Europe is the NitrOlympX at Hockenheimring Baden-Württemberg. 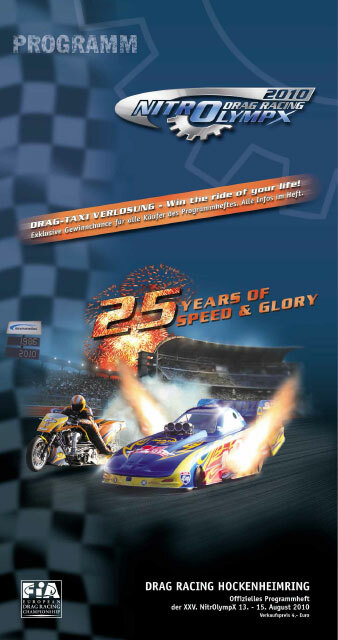 Having grown steadily since 1986, this event is an absolute “must” for every drag racing fan and those who want to become one. An average of 250 teams in around 16 racing classes take part in the NitrOlympX, which has traditionally been held in August, offering 40,000 spectators in the stands three days packed with exciting motorsport and top-class, thrilling entertainment with up to 10,000 hp. 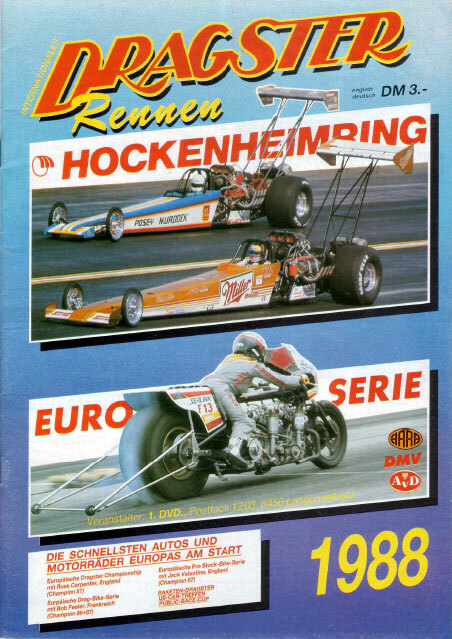 The success story of dragster sport at Hockenheimring began in 1986. 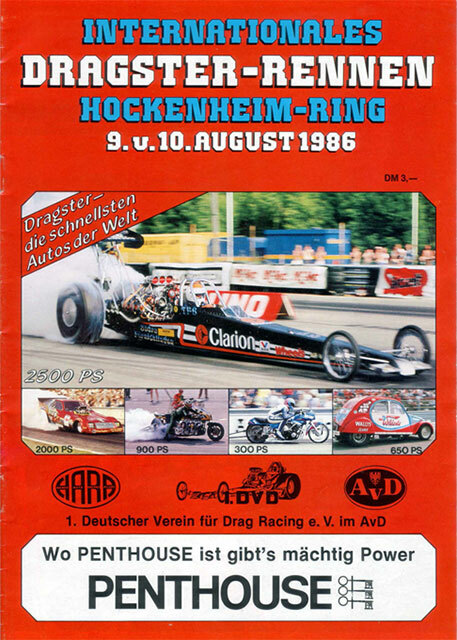 Back then, drag races still took place on the start and finish straights of the Hockenheimring. Since 1989, a circuit specially built for this kind of racing has been used. It is the equivalent to the classic quarter mile, measuring exactly 402.33 metres. 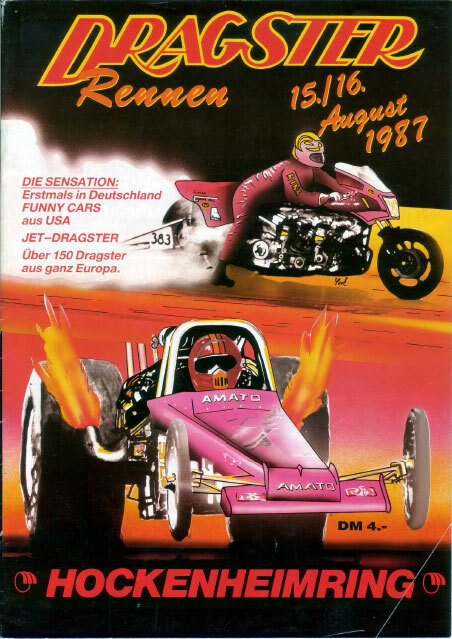 The dragster races at Hockenheimring are synonymous with the name Rico Anthes. 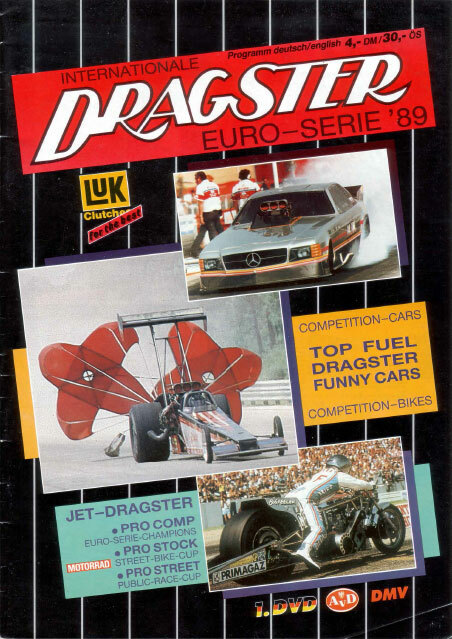 The former European champion in drag racing was the organiser and promoter of this spectacular race from 1986 until 2007. Since 2008, Hockenheim-Ring GmbH has acted as promotor and the Badischer Motorsport Club as organiser of this high-speed sporting event. As an appreciation of his life’s work, the quarter mile of the Hockenheimring was renamed the “Rico Anthes Quartermile” in 2008. 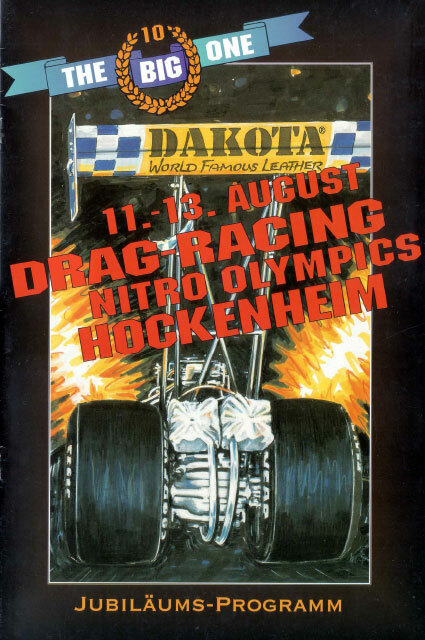 The first drag race in Hockenheim. 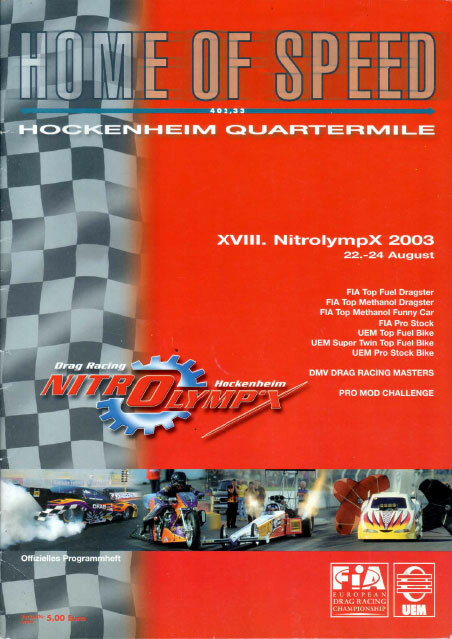 In the founding year of the NitrOlympX, racing still took place on the start and finish straights of the Hockenheimring. As this motorsport was still relatively unknown up until this point, organisers Rico Anthes, Jerry Lackey, Matthias Seidler, Hans Kloss and Georg Seiler, managing director of Hockenheim-Ring GmbH, were thrilled when over 20,000 fans made their way to the strip for the premiere alone. The “big boys” come for the first time. Two US pro teams from California travel across the pond to see what their European “brothers” have set up. 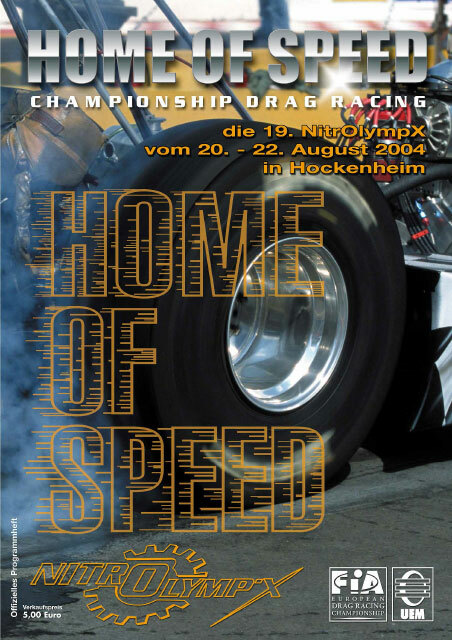 Back in the motherland of drag racing, the name Hockenheim quickly becomes a synonym for professional drag racing overseas. The first Fuel Funny Cars arrive to battle it out on the traditional Baden track. 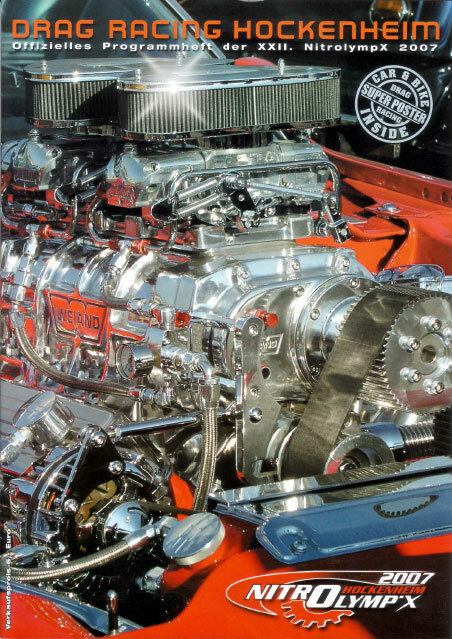 It wasn’t yet possible for this 4000 hp monster to crank up to full power on the rough asphalt, but that soon changed. Grand opening of the official “Hockenheim Quartermile”. The move from the home straights of the circuit to the brand-new quarter mile in the Motodrom is celebrated by 60,000 visitors in the Motodrom, laying the foundations for the NitrOlympX as the largest drag racing event in Europe. 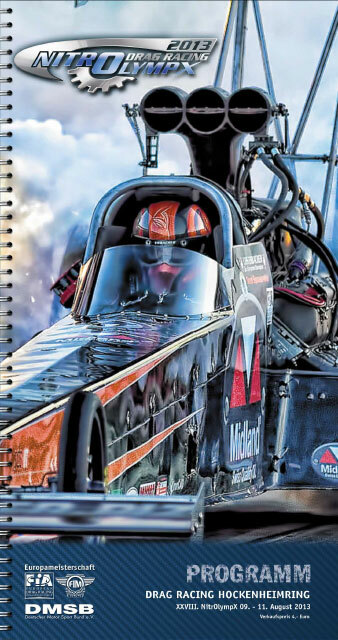 This was when the first Top Fuel Challenge took place. From this point on, not only do the pro and sportsman classes race, but also the “kings” of drag racing, thus ennobling the new racing track. A star is born. The legendary Saturday Night Show takes place for the first time. 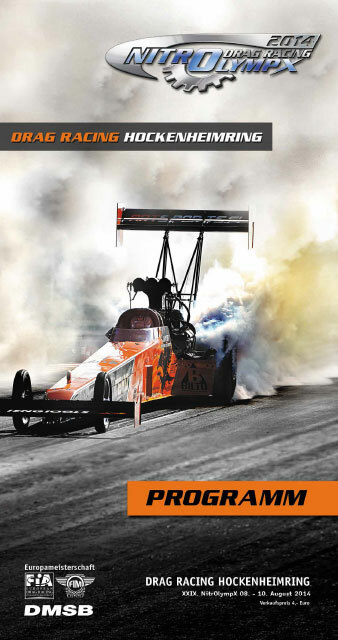 Europe’s hottest motorsport show reinvents itself every year, with flames, speed and rock ‘n’ roll, and is one of the absolute highlights of the drag racing weekend. The “magical 400” is cracked for the first time. 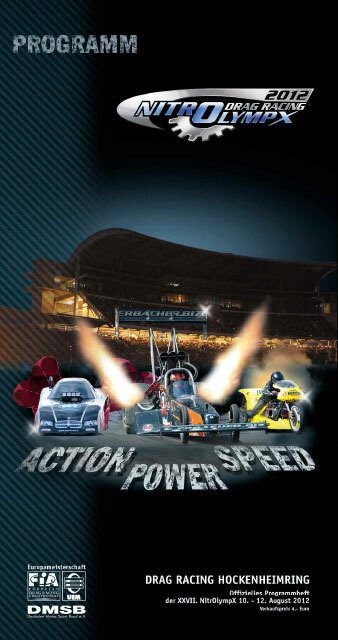 A speed of over 400 km/h from a Top Fuel dragster appears on the board for the first time ever. NitrOlympX becomes the venue for the official FIM European Championship of motorcycles in drag racing for the very first time. The two-wheelers test their skills in three pro racing classes with up to 500 hp. A legend is dethroned: Rudolf Caracciola’s speed record of 436.3 km/h in a Mercedes Benz, which had been held since 1936, is broken by Top Fuel pilot Rico Anthes. He sets the German record at 447 km/h, making him the fastest man in Germany. Drag racing with distinction. 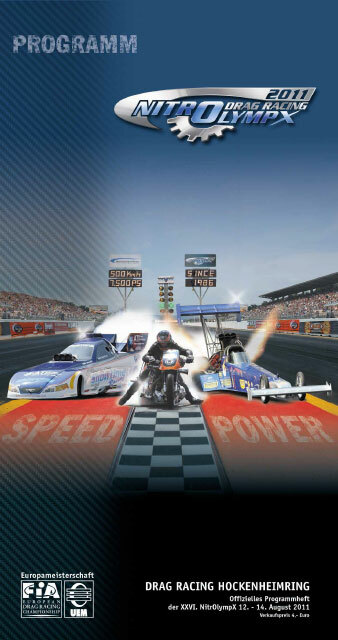 The FIA world federation adds drag racing to its calendar of events and announces an upcoming official European championship for the top three classes: Top Fuel Dragster, Top Methanol Dragster and Pro Mod. 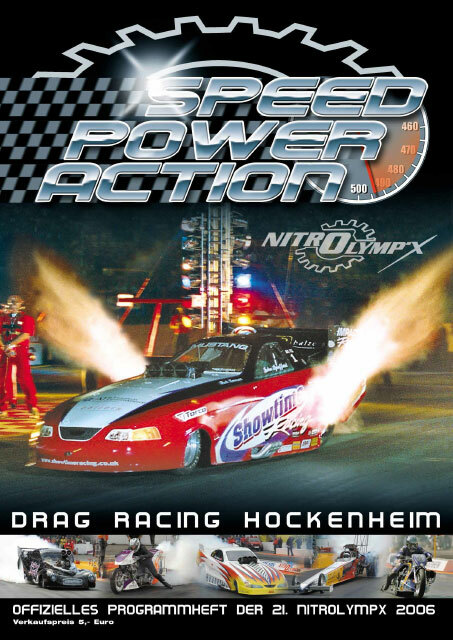 The “Pro Mod Mega Machines” appear on the screen for the first time and capture the hearts of the high-speed fans with displacements of up to 11 litres. Kent Persson from Sweden goes down in history as the first pilot with a European 4-second run, at 4.98 seconds and a top speed of 472.87 km/h on the Hockenheim Quartermile. 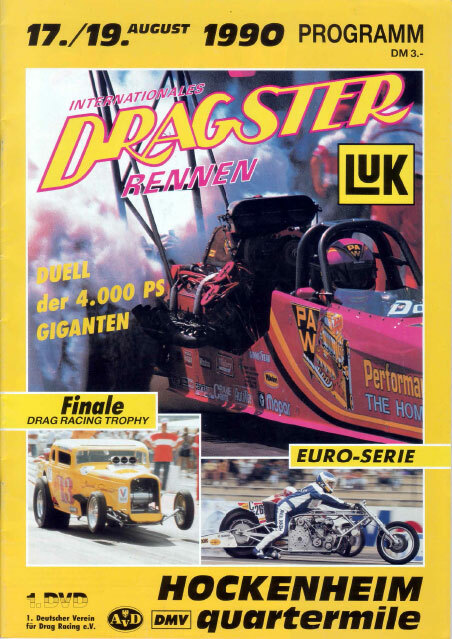 This milestone in European drag racing is thus firmly rooted in Germany. The Hockenheim quarter mile’s potential to be a top strip is proven by Rico Anthes. He beats Kent Persson’s time and enters the “4-second club”, which was still extremely elite back then, running a time of 4.93 seconds. Danielle DePorter survives a 400 km/h crash without any injuries. The American proves that it’s not just the men in drag racing who are tough, as, after a horrific crash at top speed, she is seen back in the paddock joking around on the same evening of the accident. 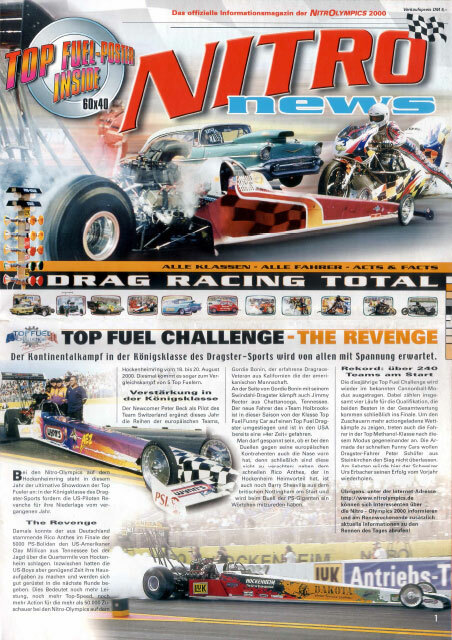 Team Germany wins the prestige Top Fuel Challenge for the second time at the turn of the millennium. The first international competition in the motorcycle class Super Street Bikes involves the largest starting field of these popular bikes, with German driver Rudi Thurmayr chosen as the first winner of the challenge. 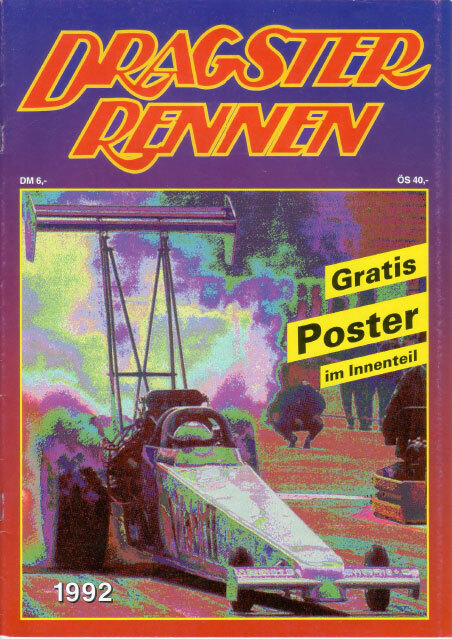 The current track record is set – Rico Anthes sets a new record with a top speed of 481.7 km/h at a time of 4.92 seconds in his Top Fuel dragster, and thus improves his own German speed record by an amazing 34 km/h. Nitro & rock ‘n’ roll – this is the motto of 2002. Alongside the athletic ranking fights and HP battles, the “Spider Murphy Gang” rock the Motodrom after the Night Show. Smart Frenchman Eric Teboul sets the record as the fastest motorcycle in the world, with an incredible time of 5.654 seconds. He takes the title from American McBride on his Rocket Bike, which has the same technology as the Apollo 11 rocket. The weekend is dominated by bikes. Two European records are broken – pro stock racer Roger Pettersson breaks through the 300 mark with a speed of 301.24 km/h. Ander Karling sets a new benchmark with his Super Twin Top Fuel bike, going from 0 to 402.33 m in 6.458 seconds. “The best Night Show of all time” – this was the vibe amongst the longstanding fans of the fastest motorsport in the world. 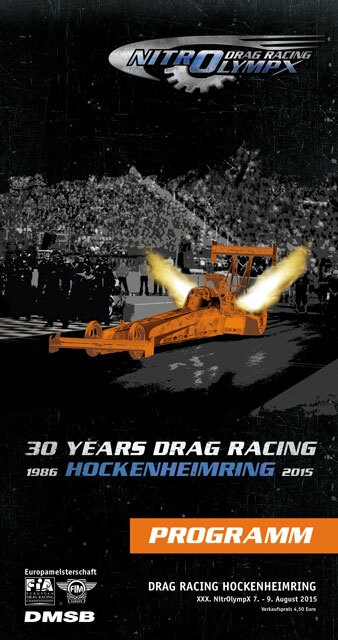 For the 20-year anniversary, the best of two decades of drag racing is presented at Hockenheimring, along with all the sporting highlights. The multi Funny Car champion and crowd favourite Urs Erbacher (Switzerland) races in the Top Fuel class for the first time, setting the new track record at the same time at 490.2 km/h. “Mad Max! Croot, the pilot of a drag snowmobile, introduces a European record on the quarter mile with 8.8. seconds. The world’s fastest bike catapults Frenchman Teboul to new records. With his unique Rocket Bike, Teboul manages a time of 5.562 seconds across the quarter mile, thus improving his own personal best by 65 thousandths. 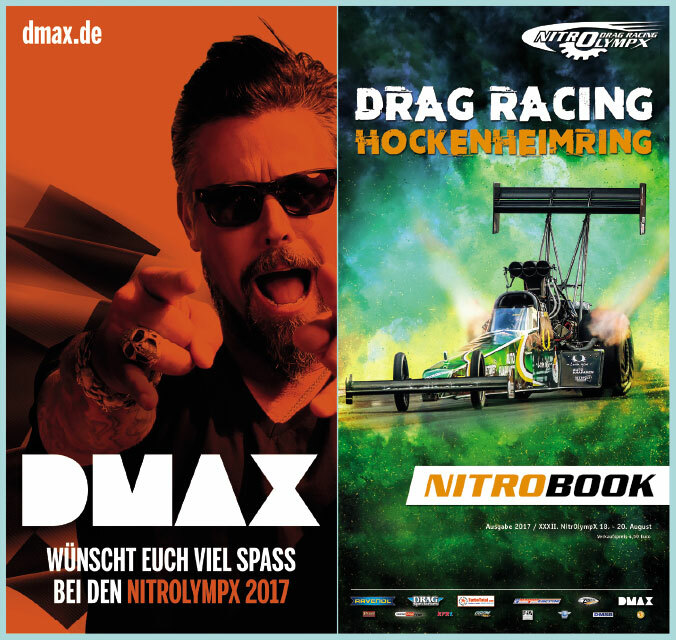 The legendary dragster strip at Hockenheimring gets a new name: After 23 years as the co-founder, promotor and organiser of the NitrOlympX, Rico Anthes hands over his “life’s work” to Hockenheim-Ring GmbH. 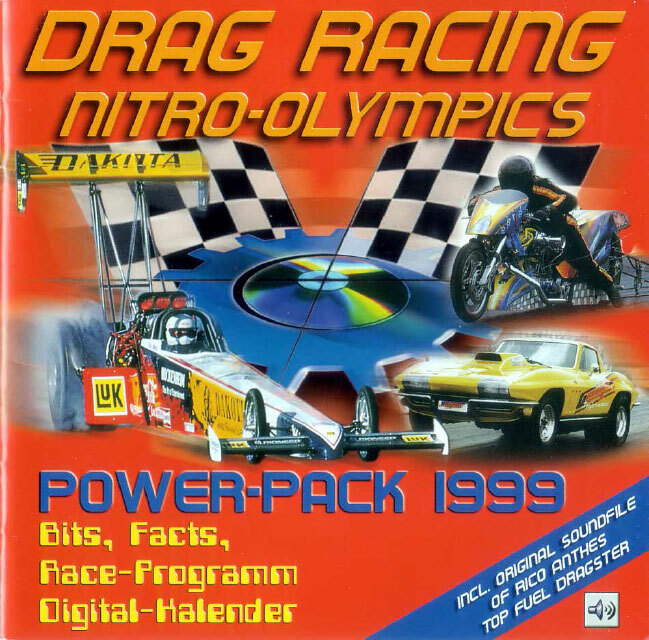 As a leaving gift and acknowledgement of his merits for dragster sport, the drag strip is immediately named “Rico Anthes Quartermile”. Mats Ericsson from Sweden achieves a new European best time in the Pro Mod class at just 6.096 seconds. Amongst the Super Street Bikes, Thomas Grancia runs the first German 7-second time of this class (in 7.950 seconds at 296.27 km/h) Even Eric Teboul is approaching new realms with his Rocket Bike. With a new world record of 5.277 seconds and a top speed of 401.13 km/h, it seemed only a matter a time before he reached the next level – the speed of light. A quarter of a century of the quarter mile. For the first time ever, the two new and exciting car classes “Super-Pro-E.T” and “Pro-E.T” can be found at the starting line, and US star Melanie Troxel races with her FIA Pro Mod. With 340 hp in the fuselage of his Zivko Edge 450, Red Bull Air Race pilot Dolderer shows the spectators that the party is not just inside the Motodrom. The airspace that goes with it is also built into the high-speed action area. As Dolderer daws his precisely planned and professionally flown shapes in the sky with a top speed of up to 426 kilometres, the speed-indulged fans can hardly stay in their seats. A track in top form! In 2013, the raceway was fully renovated, asphalted and bonded. 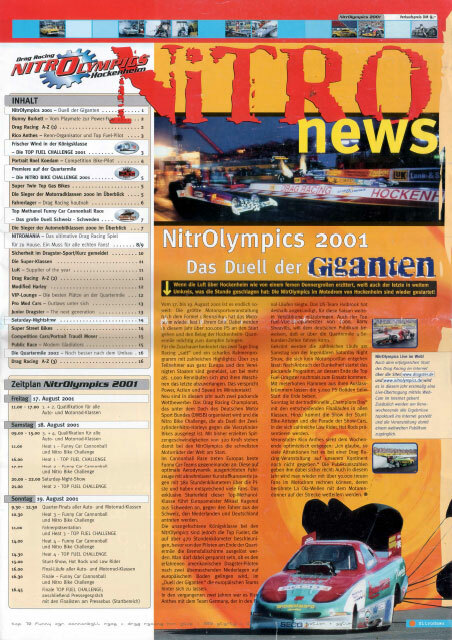 And it was really successful – NitrOlympX once again proved that not only is it the biggest drag racing event on continental Europe, but – if we are to believe the participants, fans and the international press – the best too. With the biggest starting field of all time (almost 300 teams), NitrOlympX surpassed itself once again. In perfect weather, Mario Thau manages to conjure up a new European record on the asphalt for front-wheel drive vehicles in the Pro E.T. right away. Brit Ian King not only takes home the FIM crown to England with his Top Fuel bike, but also sets a new European record with 379 km/h. 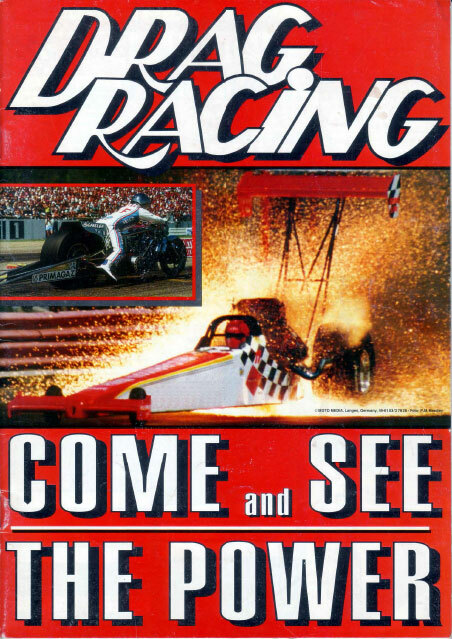 For its 30th anniversary, heated action in every sense of the word awaited visitors at the NitrOlympX: 4.1-second Top Fuel runs side-by-side on the quarter mile and temperatures of up to 40 degrees in the Motodrom. It was also hard to stay “cool” off the track: Various bands, stunt acts and the legendary Coyote Ugly Girls on the pit roof warmed up the visitors good and proper. The Saturday Night Show – by now a cult event – was a touch louder and hotter for the anniversary. 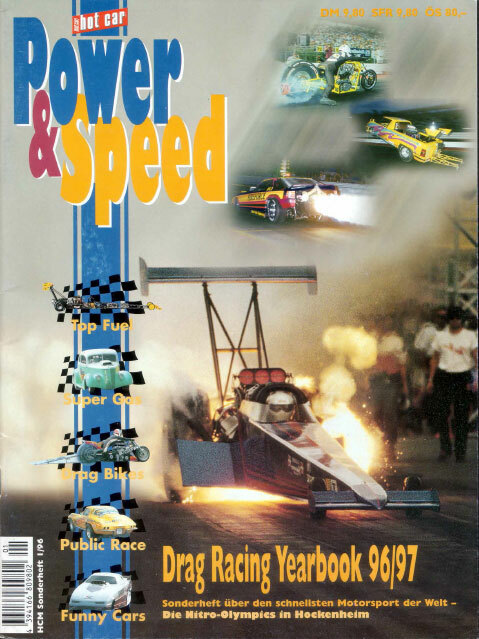 The fans went wild in the sold-out stands as seven jet dragsters blew flames up to 30 metres in length across the asphalt before their eyes. The 30th NOX was also a real sporting success that brought with it many outstanding times and new personal records. The NitrOlympX 2016 was a truly eventful weekend with many highlights. The NitrOlympX 2016 was a truly eventful weekend with many highlights. One impressive moment was the first round of the FIA Pro Stock Cars, as Jimmy Alund and Bengt Ljundahl from Sweden topped the old class track record “out of the trailer” and “side by side”, or when Brit Garry Bowe set a new European record in the FIM/E Super Street Bike class at 340.69 km/h. 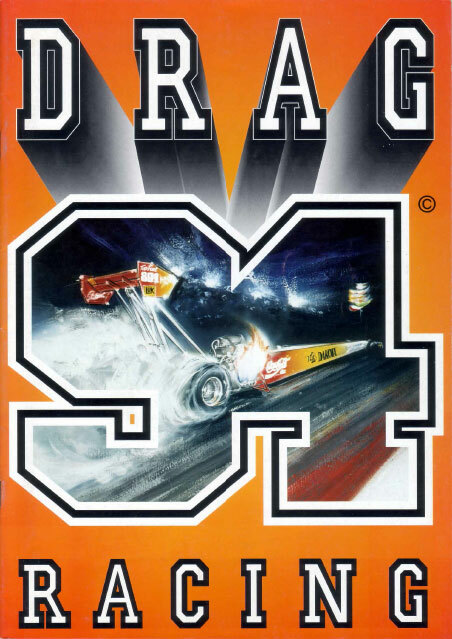 But there is one moment that can be described as utterly EPIC: After Kent Persson made the “first four second run” light up on the scoreboards in 1997, Top Fuel pilot Anita Mäkelä was immortalised on the asphalt of the Rico Anthes Quartermile just under 20 years later with the “first three second run”. Sporting furore was provided by Jndia Erbacher from Switzerland, who fought her way through her very first(!!) 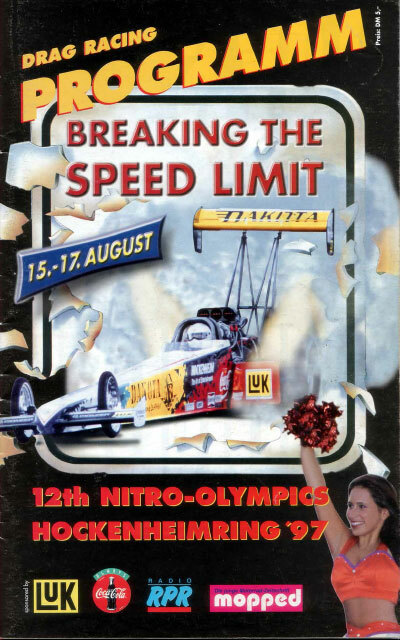 Top Fuel race to make it into the final, where she had to admit a marginal defeat (falling behind by 0.0074 seconds, or 92.73 cm) to Duncan Micallef, who would later become FIA European Champion. The fact that the Rico Anthes Quartermile at Hockenheimring is specially suited to the “two-wheel fraction” was plain to see on this weekend: In the FIM/E Super Street Bike class, several 7.0 runs vehemently demanded admission into the 6-sec zone”, while Finn Frederik Fredlund set the European speed record in the Pro Stock class with 308.25 km/h. 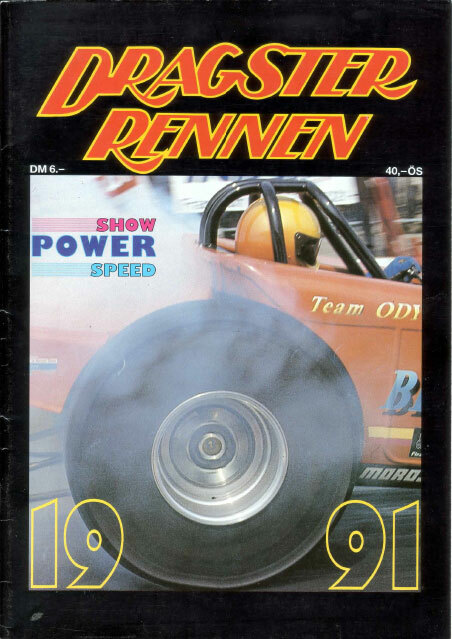 When it came to the Top Fuel bikes, Swede Rikard Gustafsson set a new standard on the Baden asphalt with 393.80 km/h. The 32nd NitrOlympX also did complete justice to its motto “Speed, show & action”: With over 42,000 visitors, the Night Show on Saturday was SOLD OUT “right down to the very last seat”, and once again offered spectators a top-class two-hour experience.